“How would PeaceBuilders Community, Inc. (PBCI) and Coffee For Peace (CFP) respond to the challenges before us? 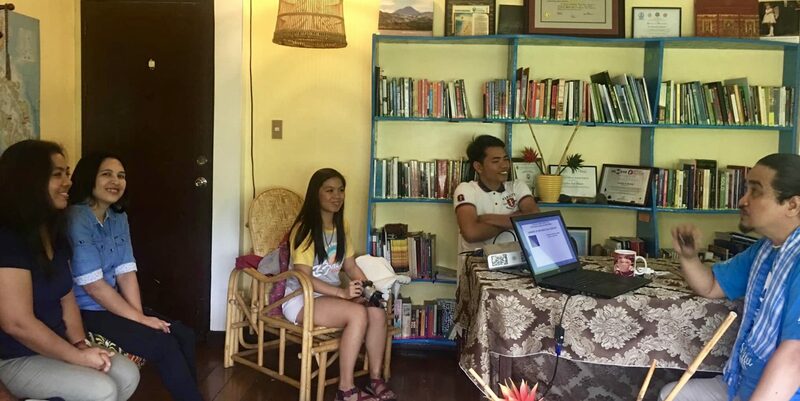 What guidance can PBCI and CFP share with PAR Communities?” Inclusive development facilitators working among Mangyan indigenous communities in Mindoro travelled to our Davao-based PeaceBuilders School of Leadership for Peace and Reconciliation (PAR) training. Some of our key Peace and Reconciliation (PAR) Community leaders are expressing grave concern with the events happening in the national scene that directly affect their local communities. How would PeaceBuilders Community, Inc. (PBCI) and Coffee For Peace (CFP) respond to the challenges before us? What guidance can PBCI and CFP share with PAR Communities? As of January, 177 farmers were reportedly killed since the beginning of the Duterte administration. The latest of these series of killings happened last 30 March in Canlaon City and the towns of Manjuyod and Sta. Catalina in the Province of Negros Oriental. It was named by the police as Operation Sauron. Some human rights activists believe this is part of the government’s intensified anti-insurgency operations which was publicly announced by the president last November 2018. These are dark times indeed. Since 2017, farmers have been crying for justice because of the escalating violence against them. They say that, unlike the drug-related killings in the urban centers, killings of farmers in the rural areas are not being heard. We also merge our voice with the voices of the religious communities and the civil society organizations in condemning these killings; thus, this blog. 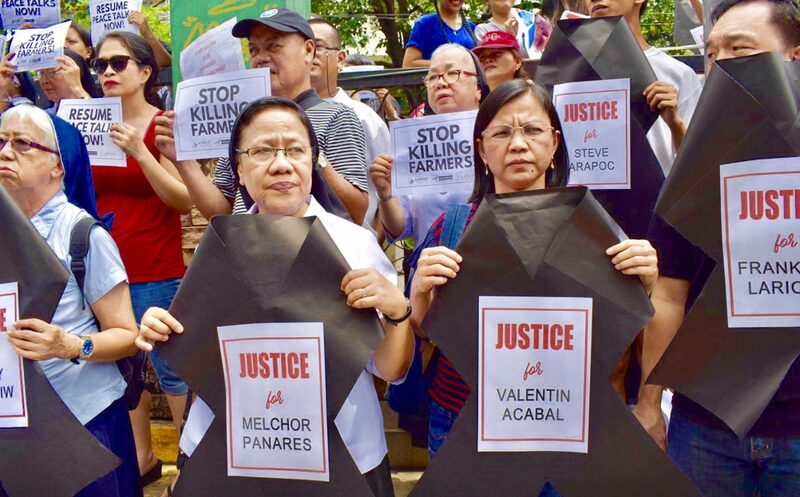 Our heart resonates with the spiritual wisdom of the National Council of Churches in the Philippines when they condemned, “in the strongest terms,” the mass killings of those 14 farmers. “Condemning these killings is a Christian duty, a moral requirement for people of faith and conscience,” their statement said. “Fourteen people have been robbed of God’s most precious gift, which should have been protected at all costs by our police and military,” they further lamented. “We also merge our voice with the voices of the religious communities and the civil society organizations in condemning these killings.” A public outcry over the killings of Negros 14 was expressed by church people in Manila. They also called for the resumption of the Peace Talks between the Government of the Republic of the Philippines (GRP) and the National Democratic Front of the Philippines (NDFP). 09 April 2019. Photo by Ofelia Cantor, Philippine Ecumenical Peace Platform. We will also carry on with our active, nonviolent approaches and long-term programs in supporting the liberation of our farmers from the unjust and oppressive systems prevailing in our land. For the past decade, we, at PeaceBuilders Community and Coffee for Peace have been actively working among farmers throughout the country in the area of inclusive development and social entrepreneurship. We say, carry on! Nothing will discourage us. This is not new. In 09 August 2016, Duterte warned Chief Justice Maria Lourdes Sereno that he would declare martial law; Sereno was perceived to be meddling with the executive branch’s war on drugs. Our immediate response would be to strengthen our solidarity with our larger peacebuilding and human rights advocacy network. Together, we will engage the government in a dialogue to express our hearts and minds as well as discern the intentions of their stated policies. So, on Wednesday, 24 April 2019, PBCI-CFP will join a “Multistakeholders’ Dialogue on the Peace Process” at the Ateneo de Davao University, Davao City. This will be a one-day policy conference with the new Presidential Peace Adviser Secretary Carlito Galvez, Jr. of the Office of the Presidential Adviser on Peace, Reconciliation and Unity (OPAPRU). The invitation letter from the Initiatives for International Dialogue (IID) indicates that participants “from other mandated peace mechanisms who will have engaging conversations with Mindanao civil society, academe, religious leaders and the other stakeholders needing to be informed by the current national peace strategy” will be present. We expect to see a “civil society engagement roadmap” as we walk with the Bangsamoro Transition and with the National Dialogue Process of the Executive Order 70 (“Institutionalizing the Whole-of-Nation Approach in Attaining Inclusive and Sustainable Peace, Creating a National Task Force to End Local Communist Armed Conflict, and Directing the Adoption of a National Peace Framework”). We look at this silent war being waged on Philippine indigenous communities as a result and a perpetuation of the centuries old historical injustice called the Doctrine of Discovery. In the 1400s, a series of Papal Bulls, falsely justified in the name of Christ, were declared. Those Papal Bulls embodied the Doctrine of Discovery and sanctioned explorers to invade, colonize, and exploit lands and peoples around the world. This doctrine is the unsound theological basis for the colonialism and imperialism that still oppress many Indigenous Peoples today. These were done by the European imperial monarchs in the name of Christ. The devastating impact of such doctrine on Indigenous Peoples was articulated during the concluding session of the 11th UN Permanent Forum on Indigenous Issues 18 May 2012 in New York. The Doctrine of Discovery and its negative impact in the history of the Philippines is still being perpetuated, wittingly or unwittingly, by the government, by the church, by the school, by the media, by the military, and by the police. Every day, we interact and work with the Indigenous Peoples of Mindanao. The ancestral domains of these peoples are being encroached by multinational corporations, using the legal processes based on the Regalian Doctrine, which is the face of the Doctrine of Discovery in the Philippines. The respective leaders and mass bases of these peoples have been struggling to protect their ancestral domains and to assert their right to self-determination. This struggle has been their way to repudiate the Doctrine of Discovery in their own contexts. As peacebuilding missionaries, we have been called and sent to listen, to learn from them, to affirm them, to walk with them, and to help amplify their voices in their struggles. 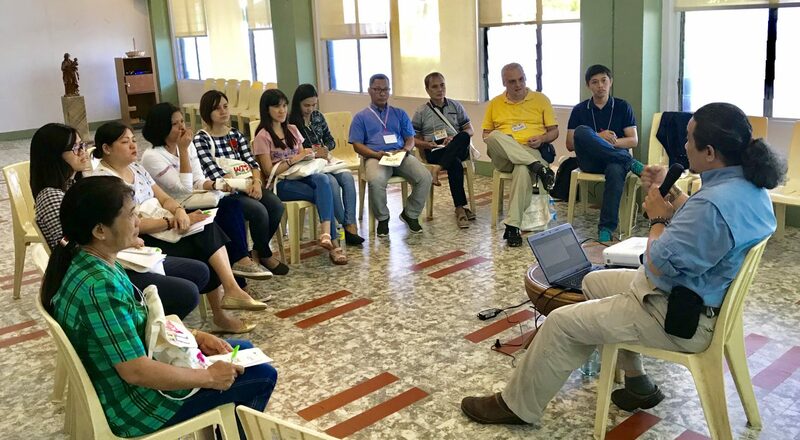 “Repudiating the Doctrine of Discovery and its negative impact in the narratives of the Indigenous Peoples in our land is part of our inclusive development ministries.” A group of transformational development workers among various IP communities discuss the importance of decolonizaton perspectives in doing our ministries and services as followers of Jesus Christ. We have a global support in this struggle. The Peace Commission of the Mennonite World Conference have proposed a Declaration of Solidarity with Indigenous Peoples. It was approved during the General Council meetings last 23–26 April 2018 in Nairobi, Kenya. The organizations we represent, PeaceBuilders Community and Coffee For Peace, are committed to help apply the said declaration in our various contexts here in the Philippines. Sending Elder: We are being taught by the Indigenous Peoples in the Philippines to join them as they journey towards their right to self determination. PAR Missionary: We will support their view of their future and we will help preserve and nurture their respective Ancestral Domains. Sending Elder : We have learned to respect the dreams of their elders and we are enriched by listening to the visions of their young people. PAR Missionary: We will walk with them towards their dream of a sustainable livelihood that respects their culture and dignity as a people. Sending Elder : We are seeing a lot of Indigenous People living on mountains higher than 500 meters above sea level who have existing coffee trees. PAR Missionary: We will share a coffee processing technology that would meet the highest local and global standards at fair trade prices. Sending Elder : We are invited to look to the future when all the Indigenous People in this land are trading fairly in local and global markets. PAR Missionary: We will assist in developing their entrepreneurial skills by practising direct trade philosophies and inclusive business models to the coffee industry. Sending Elder : We are learning that financial resources and monies earned by our farming partners through a successful coffee entrepreneurship may, at times, lead to conflict if we do not prepare them with necessary skills in personal and communal financial planning. PAR Missionary: We will journey with community leaders and their people in basic conflict resolution approaches and financial management strategies to ensure the sustainability of their newly-gained economic capacities in the context of their cultural values and customary laws. 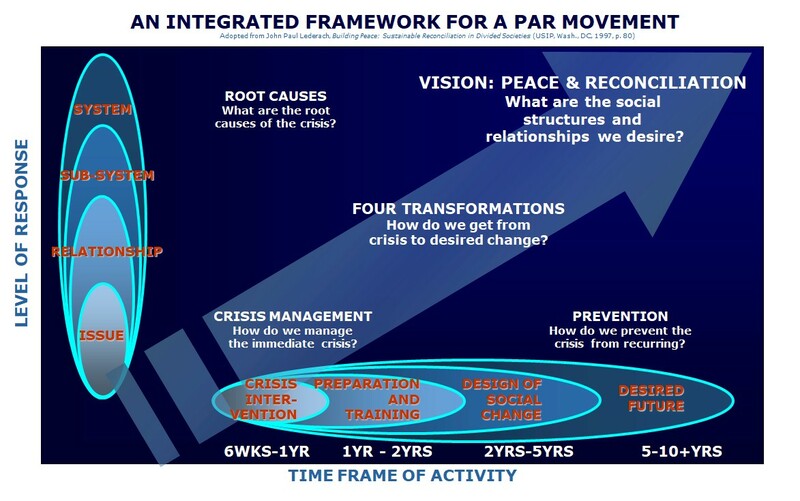 All of our responses can be packed as a whole within our integrated framework for peace-building. PBCI and CFP will seek to continue our various roles, characterized by a Christ-like servant leadership, in each PAR Community. By God’s grace, we will faithfully pursue our long-term path towards genuine peace and reconciliation.